Helps to support your body's resistance to infection and promotes a healthy immune system. For those with regular coughs & colds, or those with active, demanding lifestyles. Bifidobacteria: Bifidobacterium longum, Bifidobacterium breve and Bifidobacterium infantis settle primarily in the large intestine or colon. Natural plant extracts: (Green tea extract, Grape seed extract, Pine bark extract); Vitamin C, Live cultures: (Lactobacillus acidophilus UBLA-34, Bifidobacterium longum UBBL-64, Bifidobacterium breve UBBBr-01, Bifidobacterium infantis UBBI-01); vegetarian capsule: hydroxypropyl methylcellulose; anticaking agent: silcon dioxide.Each capsule guarantees 2.5 billion micro-organisms.Nutritional Information (per capsule):Natural plant extracts:Vitamin C 100mg (+166% ECRDA). Green Tea Extract 30% 45mg. Grape Seed Extract 95% OPC 45mg. Pine Bark Extract 95% OPC 45 mg. Drink plenty of Mineral Water with this supplement. 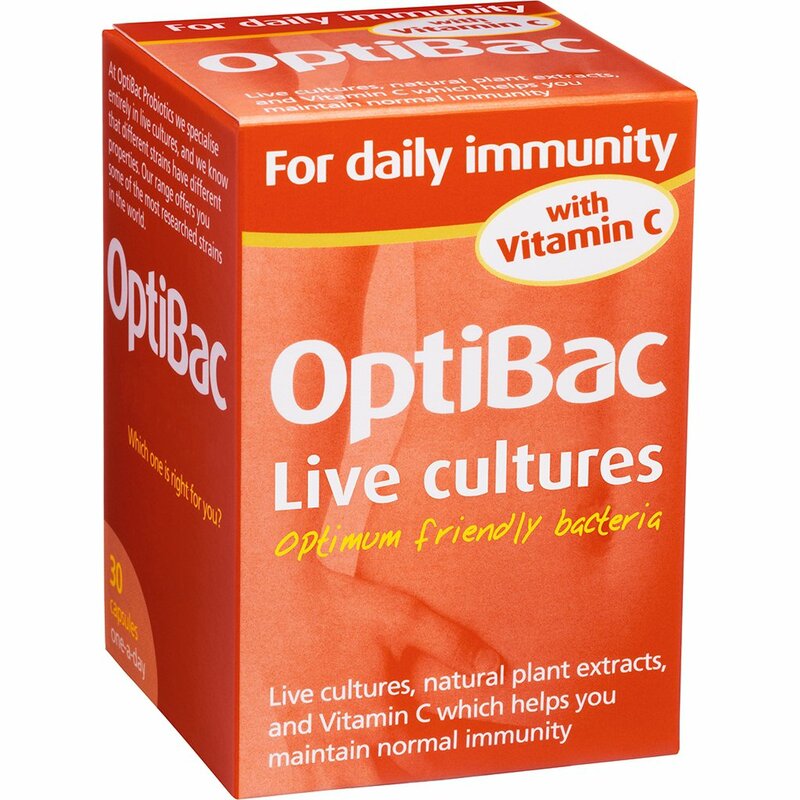 Optibac Probiotics for Daily Immunity Capsules can safely be taken on an ongoing basis. Optibac Probiotics for Daily Immunity Capsules do not require refrigeration. Store away from direct sunlight. Live cultures are not recommended for those with serious medical conditions eg. those who are severely immunosuppressed, have pancreatitis, are in the ICU, have melaena, have a central venous catheter, infants with short bowel syndrome, or to patients with open wounds following major surgery; unless under a doctor's care. Furthermore, pregnant or breastfeeding women should consult their doctor before taking Saccharomyces boulardii, 'For travelling abroad', or natural plant extracts as in 'For daily immunity.